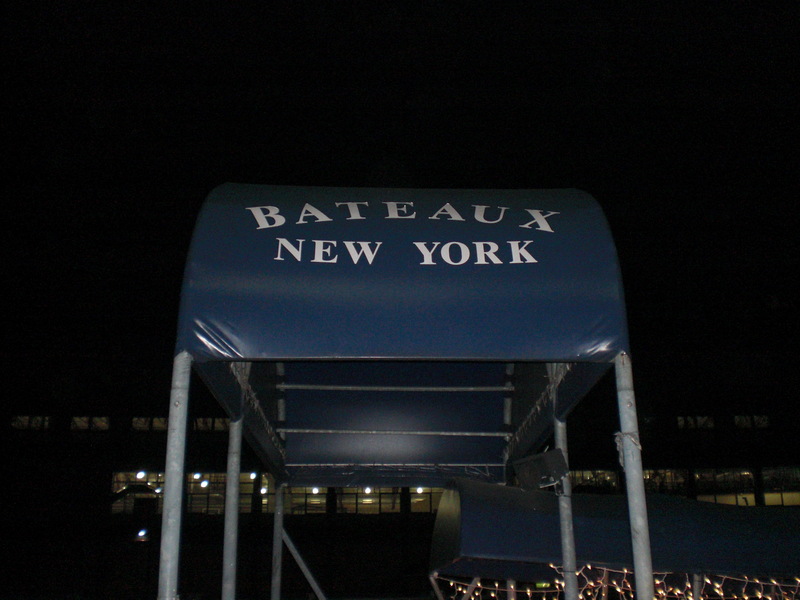 “Le Bateaux” (The Boat) in English is one of the most fulfilling & seamless experiences you will ever have the pleasure of attending in New York City as far as Food, Drink, Service & Ambiance. My dining partner and I wanted to do something special the night before New Years Eve in New York City and this was a great precursor to the Ball Dropping in Times Square when Lady Gaga hits the button 1 minute to midnight. This all glass European inspired ship will amaze you at every turn. We were greeted by an array of staff looking to cater to your every whim from the minute you step onto the dock. Seated immediately we had a private table for their 3 Hour Holidays Lights Dinner Cruise around the island of Manhattan. For $119.90 per person you will feel like royalty as they bring you to your table. 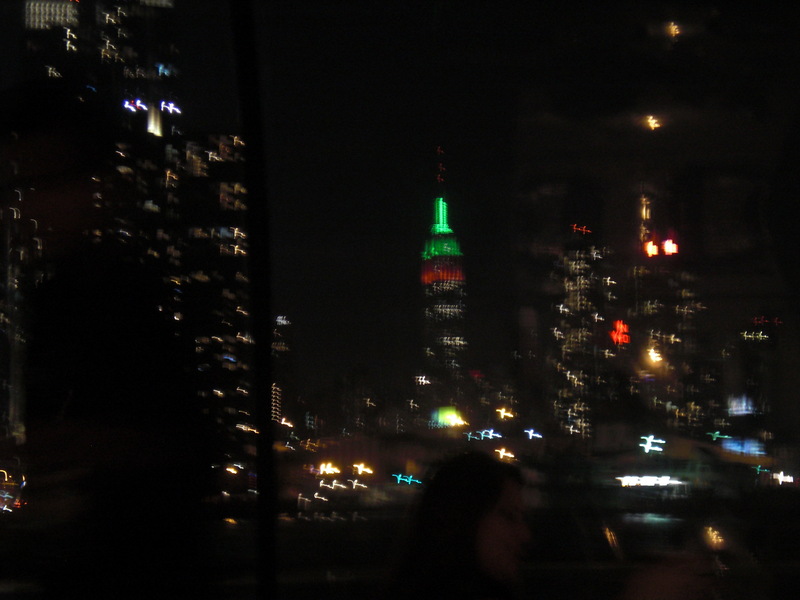 We had a private table facing the Island of Manhattan, the view just sitting in the dock was spectacular. We did take advantage of the Lunch Cruise during the month of July, but the Dinner Cruise surpassed this by leaps and bounds. This boat is encased in glass for spectacular views, the cobalt blue accents on the tableware go perfect with the dark woods and raw steel that decorates this vessel. Our server Don Luis was the epitome of professional and did not give us a chance to ask for anything, at one point we thought he had ESP and knew what we wanted before we did. We entered the boat to a 4 piece orchestra and a wonderful lead vocalist who sang, Jazz, Dance, Pop & Holiday songs, her voice was strong and delightful to listen to throughout the cruise. The boat is climate controlled and restrooms had a great design and very clean. You can get up and take advantage of the small dance floors if you are so inclined. We started with a Citrus Splash Drink for $3.50 it was a great way to start off the cruise if you are not looking for an alcoholic beverage. 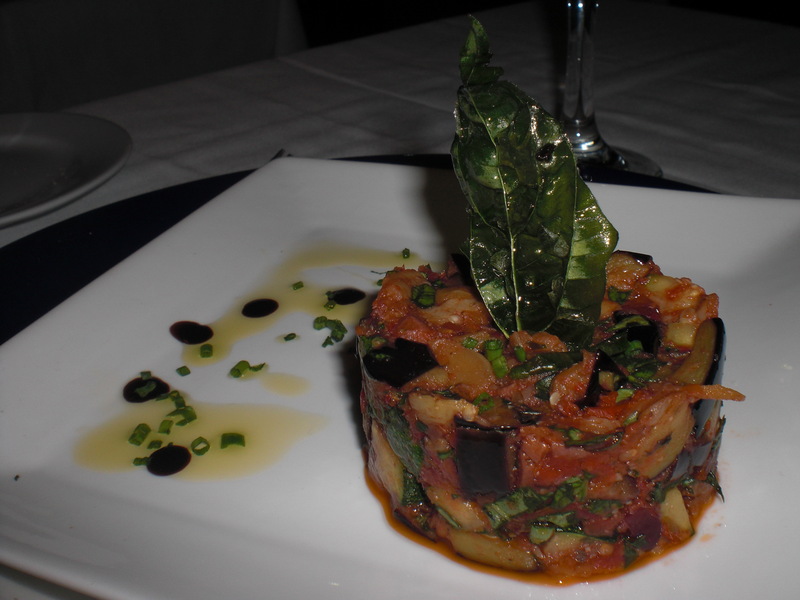 We were first served Ratatouille that was to die for, a classic dish prepared just as it is suppose to be. 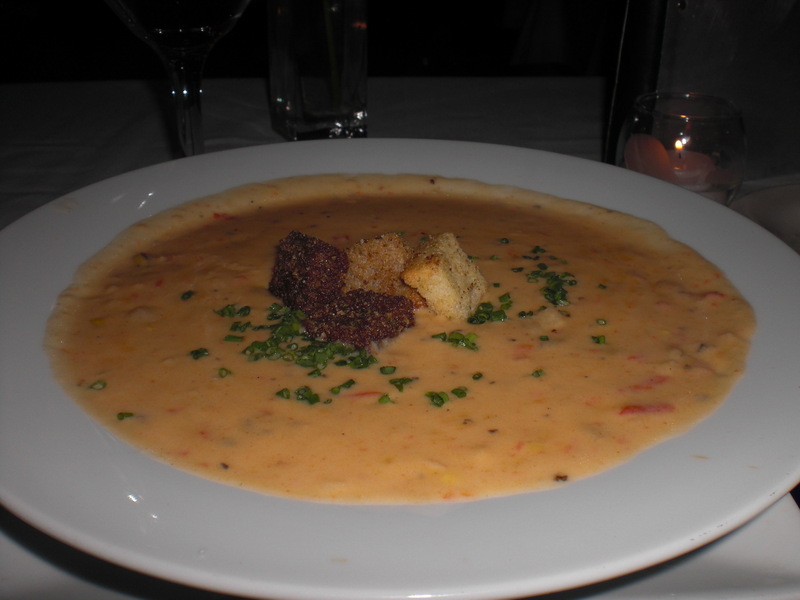 As an appetizer I had the Shrimp & Corn Chowder – Roasted Sweet Corn, Gulf Shrimp, Red Pepper and Potato with Fresh Cream. 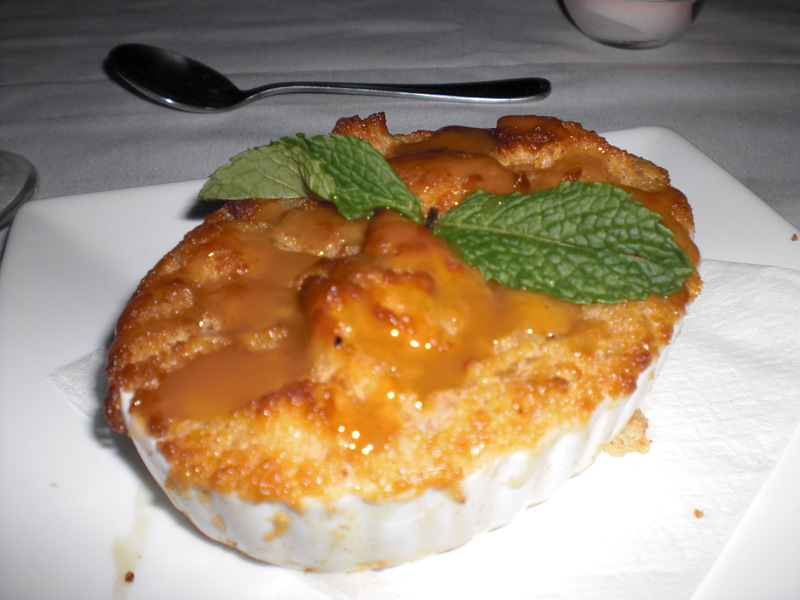 It was served piping hot and full of Shrimp & Potato, it was very fulling. 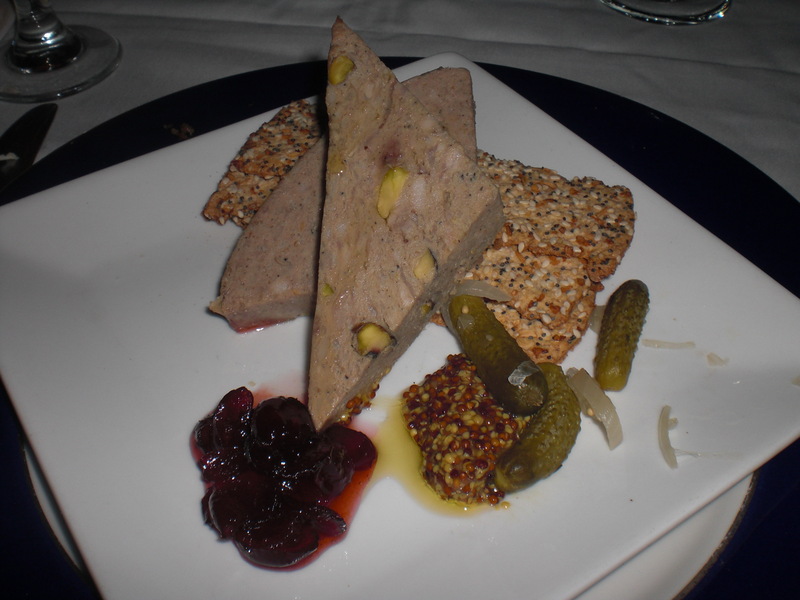 My dining partner had the Pate De Canard – Classic Duck Pate with Cornichons, Grainy Mustard and Toast Points. The Pate was plentiful, and was more loafish then spreadable but worked nicely with the crackers and accompaniment. 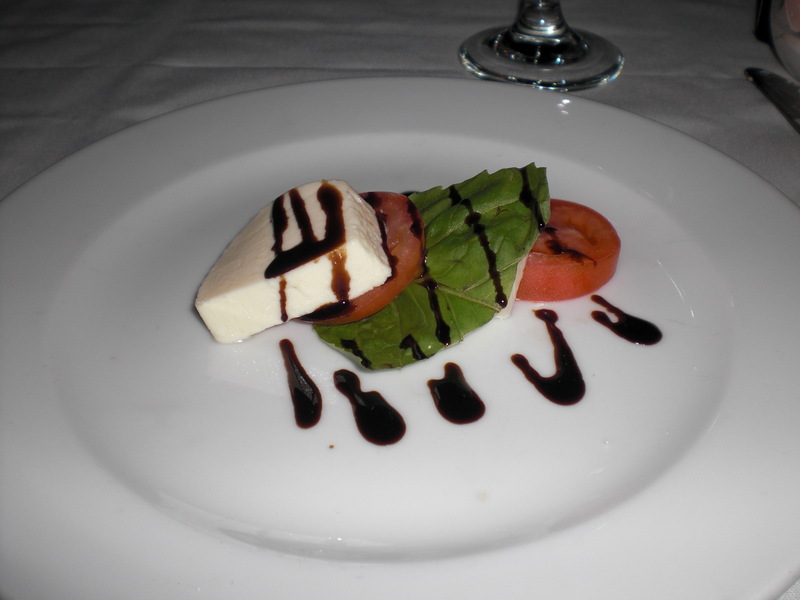 As an Intermezzo the chef prepared a Fresh Tomato, Basil and Mozzarella with a balsamic reduction and it was tasty. 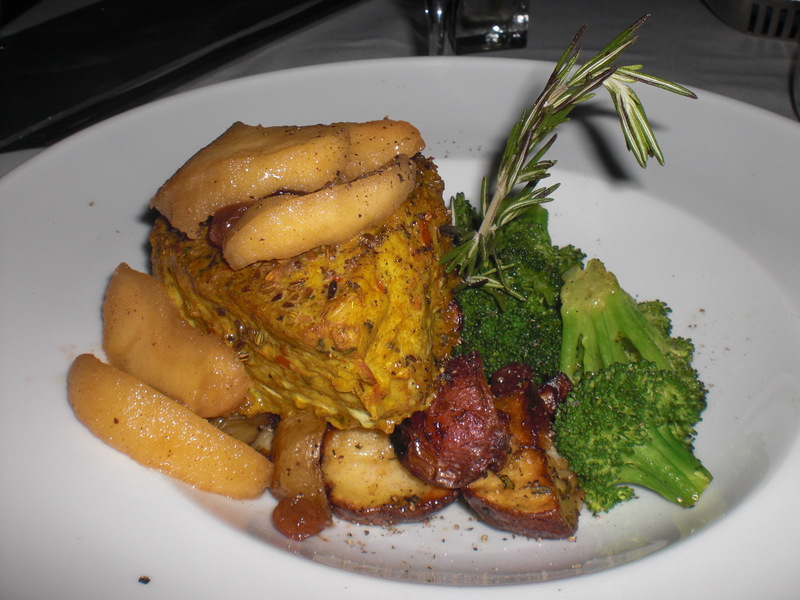 For dinner I had the Fennel and Coriander Crusted Pork Loin – With caramelized Granny Smith Apples and roasted RosemaryYukon Gold Potatoes. It was exquisite! 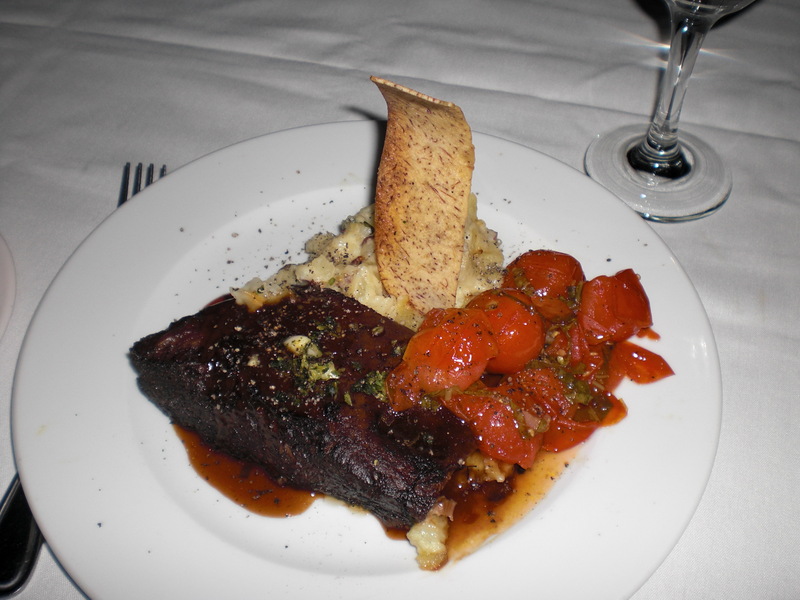 My dining partner had the Beef Short Ribs – Syrah Braised Short Ribs with Red Skinned Smashed Potatoes, Seasonal Vegetables and Gremolata. It was off the bone and delicious. Portions were just right. This dinner came with unlimited rolls, Coffee, Tea & Sweetened Ice Tea. Dessert was a Apple Bread Pudding which was the Chef’s special for the evening & my dinning partner had the Decadent Chocolate Truffle Torte – Rich two-layer moist Cake filled with a Delicate ChocolateMousse fully enrobed in a smooth Dark Chocolate Ganache, both were a wonderful way to satisfy the sweet tooth. The staff uses words like please and thank you & please which is a dying art in my book. Upon leaving the boat several staff members were serving warm cookies which was wonderful, but we were so full we could not indulge. 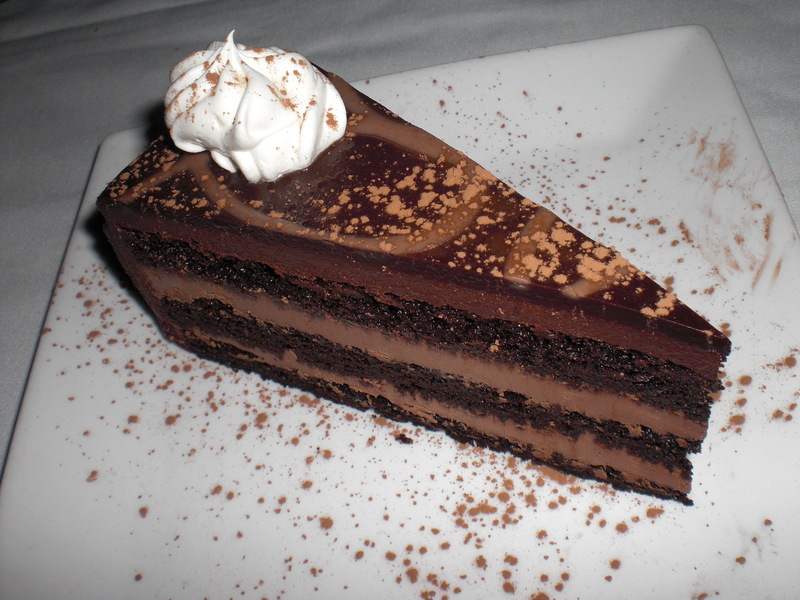 If you tell the staff ahead of time you are celebrating a birthday, anniversary or other festive occasion they will recognize this and announce it at half time. 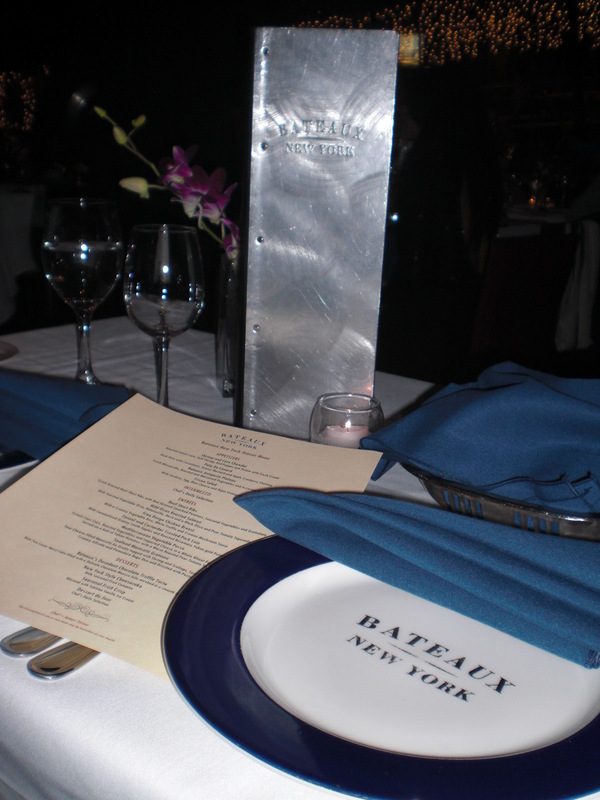 You can go to www.bateauxnewyork.com to view their menus and timetables. Management did come to the table several times to make sure we had everything we needed which was very much appreciated.